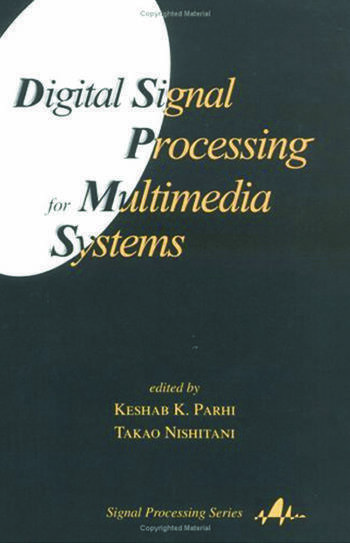 Part 1 System applications: multimedia systems overview; video compression; audio compression; system synchronization approaches; digital versatile disk; VLSI signal processing for very high speed digital subscriber loops (VDSL); cable modems; wireless communication systems. Part 2 Programmable and custom architectures and algorithms: programmable DSPs; RISC, video and media DSPs; wireless DSPs; motion estimation system design; wavelet VLSI architectures; DCT architectures; lossless coders; Viterbi decoders - algorithms and high performance architectures; watermarking for multimedia; systolic RLS adaptive filtering; STAR-RLS filtering. Part 3 Advanced arithmetic architectures and design methodologies: division and square root; finite field arithmetic; cordic algorithms and architectures for fast and efficient vector-rotation implementation; advanced systolic design; low power design; power estimation approaches; system exploration for custom low power data storage and transfer; hardware description and synthesis of DSP systems.